There are lots of ways to stream online content directly to your TV. This surge of streaming devices has seen a growth in consumer awareness, and with that awareness has comes a demand from consumers for a more robust and capable streaming device. The team at Nyrius has seen a fair amount of debate on social media comparing our line of wireless HDMI products to other popular streaming services – most notably, Roku, Chromecast, and Apple TV. To help clear up confusion on how our wireless line stacks up against the other popular streaming devices, we’ve created a simple comparison chart which highlights the key features of each product. -No WiFi Required – Every Nyrius wireless product operates completely independent of your home wireless network. Wireless HDMI streaming is made simple by removing the often unreliable wifi networks in users homes. -Mirroring is limitless – While devices such as Chromecast can only “cast” certain applications, Nyrius truly replicates exactly what your seeing on your PC, Laptop, Gaming system, or Cable box. -No Latency – Anyone familiar with gaming shudders when they hear the phrase “lag” or “latency”. With the Nyrius ARIES line, rest assure you won’t be seeing delayed responses to your button mashing. The ARIES line will completely gaming system with 0 latency. -Pause, Play, Change Channels – any function available on your remote control will work in another room using the IR remote control extender. -3D Compatible – Need to wirelessly stream a 3D Blu-Ray? No problem. 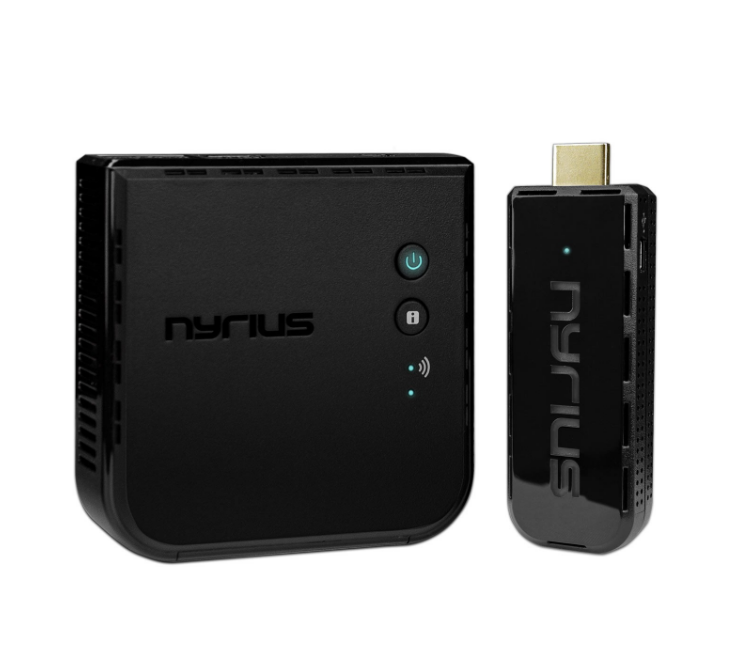 Nyrius can easily replicate your favorite 3D movie wirelessly.